Kim Jong Il North Korea- Mount Paekdu, February 16th 1942 - These are the official birth details of the current leader of the DPRK. At the end of the Second World War in 1945, Kim Il Sung returned to Korea, Kim Il Jong, still at a very young age, was to rejoin him in Pyongyang later that year. 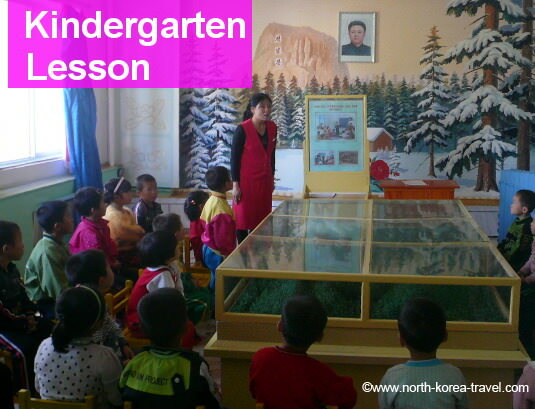 Kim Jong Il carried out his primary school studies in Pyongyang. In the image above you can see a history lesson at a kindergarten. The image in the background shows the cottage where Kim Jong Il was born in Mt. Paekdu and if you notice the board in the front you can see the image of Kim Jong Il lecturing his classmates. According to Kim Jong Il's official biography, he was extremely involved in politics, being member of the Democratic Youth League, promoting political discussions in school amongst schoolmates (as n the picture shown in the photograph above) and organising extra-curricular activities such as factory visits. Please click on the link Kim Jong Il to go from our Kim Jong Il North Korea section to see information of other life periods of the North Korean leader.